With countless kudos to their credit, including SEVEN Parents’ Choice Awards, the band considers its main focus to be providing a common ground where all family members can enjoy a shared musical experience. Drawing on original songs and traditional material, the band seamlessly integrates classic Americana with their own unique sound. It’s kids, it’s families, it’s music… live music. The band is in their seventeenth year of making music for families. That includes twelve recordings, tours up and down the east coast, and a week of shows in Colorado. 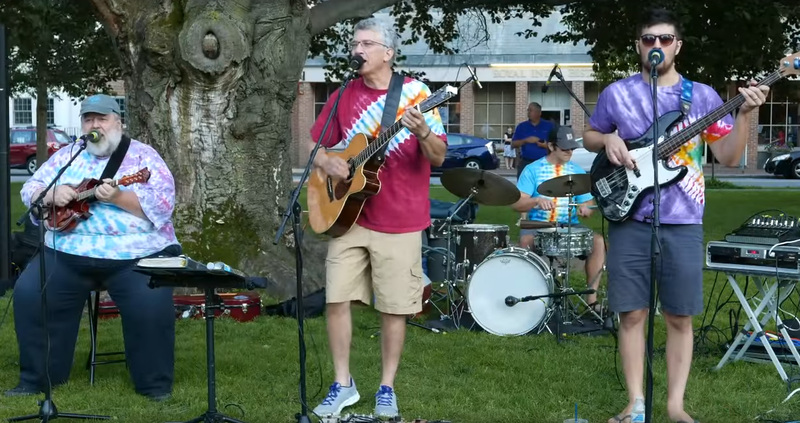 The band is an institution in the Boston area and are happiest when playing outside on a perfect New England summer evening. The tightly-honed quartet ties its identity to their New England homeland. Their sound is pure Americana. There’s a summer feel, a strong sense of celebration and happiness. Ben Rudnick & Friends play the hippest family music around. With countless awards to their credit, including SEVEN Parent’s Choice awards, their adventurous, high-energy blend of happy, upbeat acoustic music is guaranteed to entertain the entire family.Bending musical styles from country to bluegrass, rock to second-line New Orleans, their original songs and fun takes on familiar tunes make you sing, make you dance and make you happy. Join the fun! Multiple award winners in family music, Ben Rudnick & Friend’s adventurous acoustic music and lyrically humorous style have won them fans of all ages. Whether on stage or record, the band’s formula of delivering interpretations of favorite, well-known songs combined with get-up-and-dance original tunes is a winner. Concerts are community-building events; the recordings bring families together. Ben Rudnick and Friends make people happy and that makes them happy. Fun for all!